For 72 years, from 1848 -1920, generations of women - from every state and every party, of every race and every religion - fought for the right to vote. 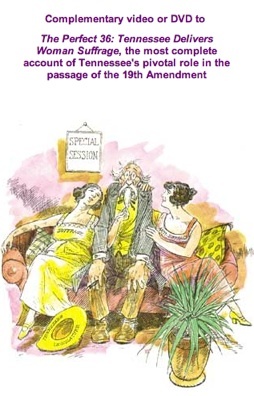 The 19th Amendment was introduced in Congress 42 years before the House and Senate could muster the 2/3 majority to pass it. And that vote was just the beginning of another round of state battles - the final battle for ratification. This 12-1/2 minute DVD, covering 72 years of suffrage history, describes the struggle the suffragists faced. Would women gain the right to vote before the 1920 presidential election? 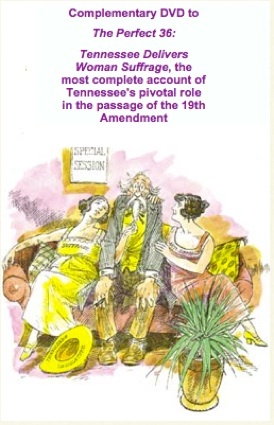 Which state would be the "perfect 36" to ratify and make the 19th Amendment law? The answer came when Tennessee, the last state that could possibly ratify, convened in special session on Aug. 9, 1920. This final battle to include women in the U.S. Constitution was especially fierce. Suffrage supporters wore the yellow rose while the "antis" countered with red roses. On August 18, the day of the final House vote, 24-year-old Harry Burn, the youngest member of the Tennessee General Assembly, acted on the advice of his mother, and cast the deciding vote granting all American women the right to vote.